The primary weapon that Robocop uses in the original 1987 film is the Beretta 93R. The main weapon used by RoboCop (Peter Weller) is the "Auto 9". 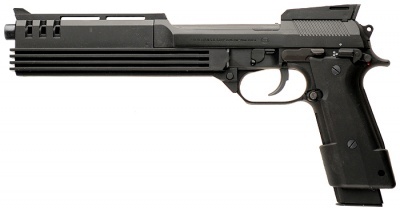 This is a Beretta 93R machine pistol which was heavily modified for the film, featuring a longer barrel with an enormous compensator/flash hider shaped like a casket (which apparently made the trademark gun twirl fairly difficult to perform), plastic grips, and a taller rear sight to match the raised front sight. Typically, RoboCop fires this weapon in 3-round burst mode. The fictional stats of the weapon claim it has an implausibly huge 50-round magazine. Originally it was planned for Robocop to simply carry a Desert Eagle, but Verhoeven felt that the pistol looked too small compared to Robocop's bulky armour, so a special weapon was devised. Not the answer you're looking for? Browse other questions tagged props robocop . What kind of flashlights are used in the X-Files by the FBI? Nylon brush in a Western? How realistic is the scene where Robocop bends barrel of a gun being held by a man? What was the original Robocop's suit prop made of? Which is the oldest non-fantasy movie to design unique weapon for the character? Why do the technicians on duty not care about what happening to Robocop when he's Dreaming? What causes the “stretched arms” effect?